Membrane curvature refers to the physical bending of membranes to accommodate various cell morphology changes as well as the formation of membrane-bound transport intermediates like spherical vesicles or tubules. As membranes are inelastic and resistant to spontaneous bending, membrane curvature is generated through active processes mediated by specialized proteins, lipids and the cytoskeleton. Although curvature is not an inherent property of membranes, it is an essential physical parameter that is seen in all eukaryotic organisms. Membranes need to be bent to impart a shape to cells, internal organelles, and vesicles. Bending of membranes is a requisite for the formation of spherical vesicles, which are critical components of membrane trafficking, and for changes in cell shape during cell migration and cell death. Membrane bending is also observed in cell division as the membrane pinches off during cytokinesis. The physical constraints of membrane curvature also modulate the distribution of transmembrane proteins  as well as the recruitment of many peripheral proteins to organelles . The various mechanisms responsible for the generation of membrane curvature have been summarized in a recent review . Illustration depicting how the physical shape of lipids and proteins give rise to membrane curvature. Note how conical shape of lipids or proteins impart a positive membrane curvature whereas inverted conical lipids/proteins impart a negative membrane curvature. One of the mechanisms is attributed to the specific shape of the lipid group that makes up the membrane and to any changes in their distribution or symmetry . Lipids like phosphatidyl ethanolamine (PtdEtn) have a smaller head group to acyl chain ratio, and therefore have a conical shape. As the head groups of PtdEtn lipid clusters come closer together, the broader acyl bases impose a positive curvature on the membrane. Conversely, lipids with a large head group to acyl chain ratio, like phosphatidyl inositol phosphates (PtdIns), have an inverted conical shape and thereby impart a negative curvature to the membrane when they associate together. Cylindrical lipids like phosphatidyl choline (PtdCho) and phosphatidyl serine (PtdSer) do not influence membrane curvature. Therefore the size of polar head groups compared to the acyl chain determines the intrinsic shape of the lipid and this can subsequently influence membrane curvature. Similar to lipids, the conical or inverted conical shape of some transmembrane proteins can bend membranes (). Furthermore, protein crowding at the transmembrane domains of receptors, oligomerization of integral membrane proteins and clustering of transmembrane receptors can all affect membrane bending. Insertion of protein motifs like amphipathic helices, as in endophilin and Arf proteins, and hydrophobic loops, as in synapotogamin-1 and Pascin, can also induce membrane bending, albeit at smaller scales  . Membrane curvature can also be induced externally by specialized proteins like the coat proteins and BAR domain proteins. Coat proteins like clathrin oligomerize around the membrane, forming a scaffold that stabilizes membrane curvature during vesicle budding. 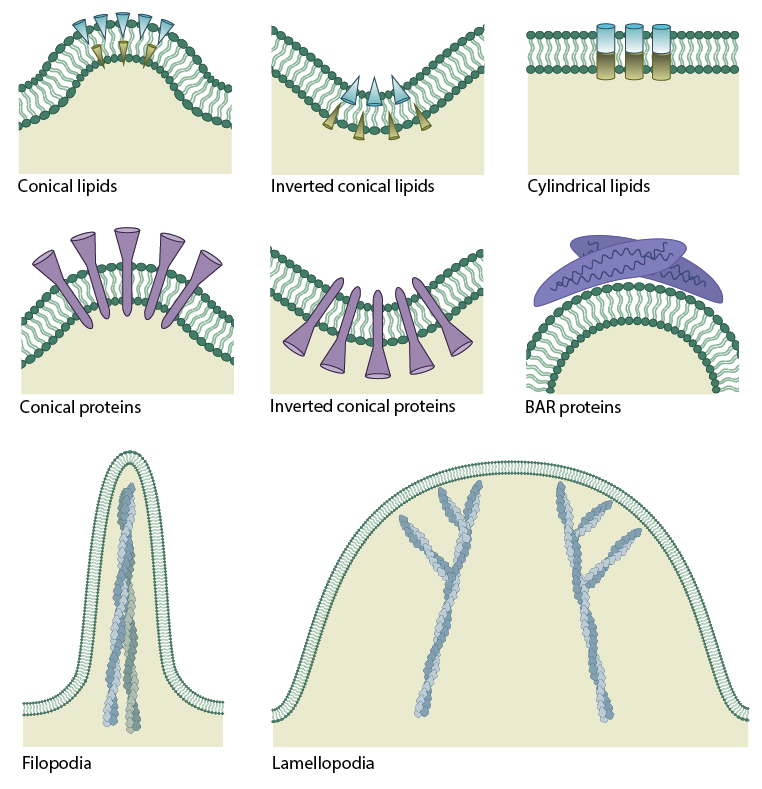 Other examples of proteins that influence membrane curvature during vesicle budding include COPI, COPII, caveolin, and flotillin. Dynamin can induce further curvature on pre-existing curvature by spontaneous polymerization forming spiral structures around the neck of budding vesicles. Bin/Amphiphysin/Rvs (BAR) domain proteins are crescent-shaped dimeric molecules that bind and bend the membrane through a concave face . The cytoskeleton plays a major role in large scale generation of membrane curvature (reviewed in ). 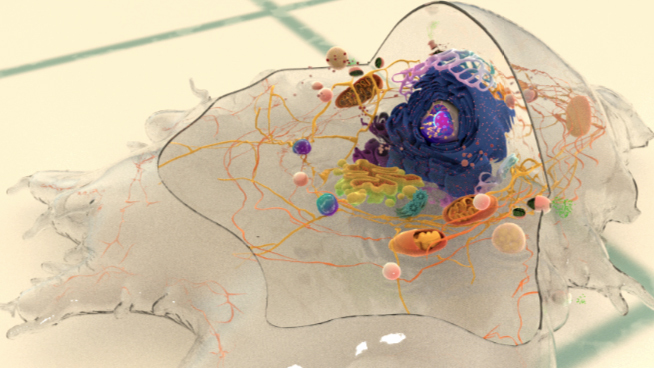 Membrane bending during lamellipodia and filopodia extensions, mitotic cell rounding and maintenance of membrane curvature within internal organelles like golgi and endoplasmic reticulum are all mediated by the cytoskeleton.